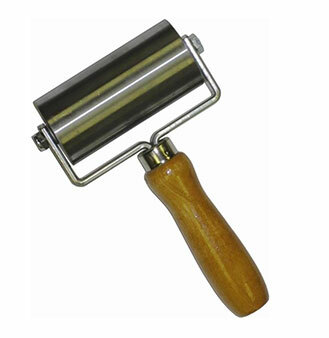 PRODUCT: Everhard Steel Seam Roller, 4" wide x 2" diameter polished steel roller, double-fork, ball-bearing, professional grade with 5" hardwood handle. Price/Each. Shipping Notes: One unit fits USPS Priority Mail, Small Flat Rate Box. Polished steel seam roller is ideal for use with Eternabond Roof Seal Tape and hot-air welding of seams. These steel rollers are Everhard roofing rollers, made in the USA, and are proven products in the roofing industry. These long lasting tools have enclosed ball bearing rollers, 5" wood handle and straight double forks.